I haven't posted anything for a couple of weeks because the heat was bad and I retreated into the air conditioning. Then when I could have gone kayaking out on the bay the winds were too high to make it at all enjoyable. I go kayaking for enjoyment - NOT to get a very heavy work-out paddling against winds and swells! The end of last week was the highest tide for the summer and even though the wind was still very strong I decided to get what photos I could from the land. 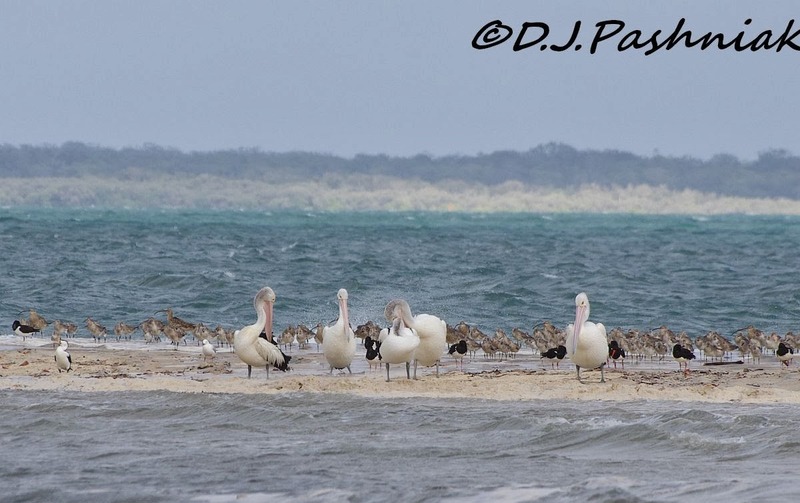 I haven't been out to Inskip Point for some time because last time I was out there I found there was just not enough sand on the point for people and birds - and in a situation like that people always take precedence! The sand island that is usually crowded with birds was completely under water so the birds from there must have joined those on the point. As the tide got even higher the birds began flying as a wave washed over, and then settling down again as the wave retreated. Right out on the end of the point there were bigger birds - Pelicans, Cormorants, Eastern Curlews and Pied Oystercatchers - as well as the Bar-tailed Godwits which will stand wherever the water is not too high. The birds gradually had to move away from the far end of the point and I could get some closer photos of Bar-tailed Godwits and Great Knots. 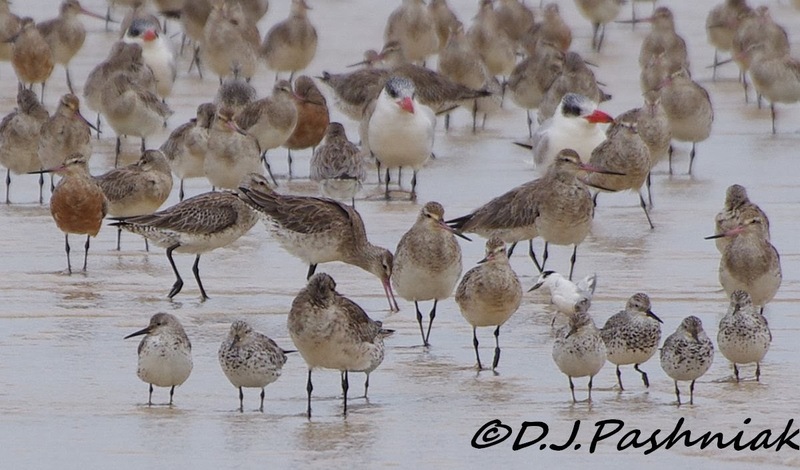 Most of these birds showed some breeding colors on their plumage and a couple of the Godwits in this photo have the lovely bright red color right down their fronts. Before they leave on their northern migration all the colors will be brighter and more completely covering them. Red-necked Stints and Red-capped Plovers were roosting close to the end of the trees at the very start of the Point. The sand here was still dry when I first arrived but as time went on the waves were washing over even this area. 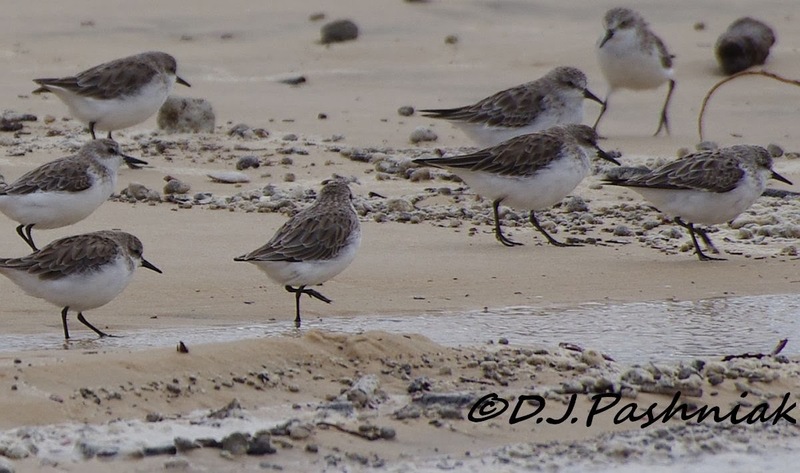 These little birds also flew up and settled down again several times but eventually took off across the channel in the direction of Fraser Island. This photo gives good views of the in-flight plumage patterns. 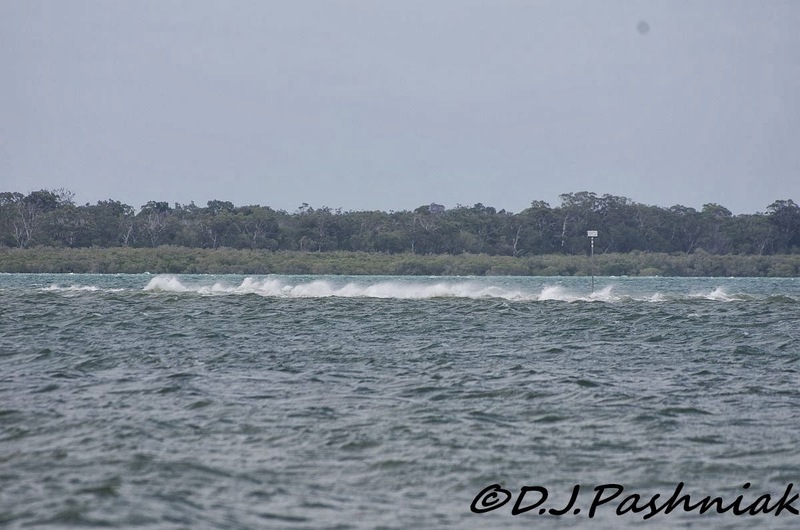 I will show more photos of the very high tide around other areas of the bay in my next post. a lovely mix of shorebirds! hope the heat has become bearable. Thanks Therese - the extreme heat has gone but not the big winds! Have to get down that way soon to see all the birds. Thanks Neil, just wish for some calm weather first! Wow, awesome collection of shorebirds. Great photos, I hope the weather turns cooler for you there! Have a happy week! Our summer must be nearly over - I hope! - but I also hope that there is still enough nice warm weather for me to see more of the shorebirds before they migrate. 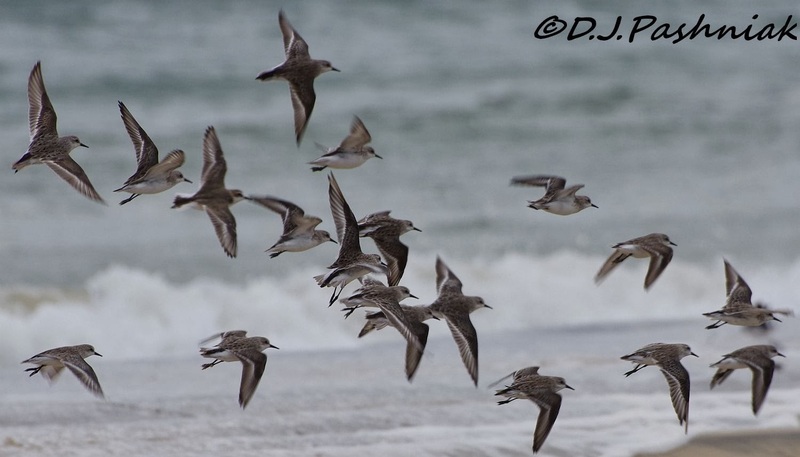 Good luck on seeing more of the shorebirds before they migrate.. Thanks - I might need that luck! It is blowing a gale again today! Thanks for commenting Carol - wish I were smarter with low light captures - not enough practice in this climate I guess. I always enjoy your amazing photos! I wish we had more shore birds close by. Thanks Bettyl. I know NZ has shorebirds - but it's a pity that shorebirds are so fussy about their environment. You've had it warm similar to us down south - but don't wish for winter yet as you never know what we'll end up with. Thanks for your comment. I am hoping the weather calms down a bit before the birds fly off again on migration. Our winters here are usually very mild. Lovely bird shots! Hope it's cooled off. Thanks for your comment and yes it seems as if the worst of the heat might be gone - here's hoping anyway! A wonderful place and beauitful photos. Oh how pretty those godwits are with their red fronts! I don't think I've ever seen that much color on any shore bird (not counting oystercatchers). I hope it's cooling down some so you can keep on getting out; we missed you! Thanks Sallie! Nice to know I was missed!! I hope I can get some more photos of the shorebirds in their breeding colors before they leave. It has cooled down but the wind is still too strong for me to want to kayak. Great shots Mick, and its always interesting to get some idea of the terrain you are in. Thanks Gordon, photos make it so much easier to show the differences in the environment on the other side of the world! Gosh, it amazes me every time I visit and see so many shorebirds! All great shots, and that last one is terrific! Thanks Karen, the last one is my favorite too but taken more with good luck than good management! Wonderful shots. I like the flight of birds. The shorebirds certainly gather tightly together. fascinating views of them dealing with the waves and love the angle of their flight. Thanks for commenting Gemma. Almost all the shorebirds seem to prefer to roost closely together on high tides and when the tide is extra high they pack in extra close. Love the birds in flight. There's a great mix of birds in your shots Mick. The numbers and the many species involved must make for some concentrated birding so as not to miss anything. Such a shame about the winds and too many people. I often have the same problem hereabouts. Hi Phil, it always surprises me how many people seem to be completely oblivious of the birds - Inskip is especially bad that way. re the numbers and species mix - I always come away quite sure I have missed something! seems you had a troublesome time in Australia. Glad it seems to get a bit better. At least you still have a lot of vaders around. :) Great shot as always! Thanks NF. I'm just not used to this amount of very hot and windy weather at this time of the year. So many wonderful birds and the view out over the water is beautiful. I hope the weather is beginning to be a little cooler now, at least at night so you can get good sleep. I love seeing all those shorebirds. It is definitely cooling down now and this morning I woke to hear light rain falling - not more than a few mm but it is a start! I'm always amazed at just how many birds you do see. That last shot is a delight! Hi Carletta, there are lots of birds around the bay and part of it is knowing where to look and part is pure luck in finding them! It was much cooler today than its been for many weeks! Hi Mick. what an amazing selection of waders and fantastic shots. Hi Margaret, the summers here are definitely great for shorebirds - I need to get out and enjoy them while they are here. Great pictures - I'll trade a few northern terns for a couple of gull species! Hi Stewart I thought you had a few more tern species down your way that we don't see up here? I guess birders like to travel for the varieties they don't see at home! Beautiful....the scenery the sea and the birds!!!! always look forward to you posts of the local shore birds. Natures high tides certainly makes the birds mobile making use of the areas above water for as long as possible, nothing better though of seeing large flocks of waders on the move. Thanks for commenting Dave. I wish I could have got a bit closer to the main flock but didn't quite dare to walk out with the waves washing over the way they were. Wonderful as always....enjoy the heat Mick, so cold in this part of the world. Nice to see the quantity of shorebirds there as they are missing here. It is incredible how you have so many shorebirds. Thanks Nora for commenting. There are always lots of shorebirds here in summer - just need to enjoy them before they leave for up north. Very enjoyable post. I guess the wading birds will have plenty to eat as the king tides recede.